A hopping spot for ice-skating is Frog Pond on the Boston Common. Although dependent on the weather, Frog Pond has its own ice-making system. It also offers skate rentals and hot cocoa at the Pond Cottage. The prime location of Frog Pond makes it easy to squeeze in just an hour or so of ice skating before or after another activity downtown. Why not go skating while waiting for a movie at the Boston Common Loews Theater? Or go skating to relax after a crazy day of shopping in the nearby Downtown Crossing. And for the hopeless romantics out there, go on a skating date under the starlit sky. Opening Day is weather Dependent. Please check the Frog Pond Website for detailed information on weather and dates. Open on New Year's Eve until 3:00pm for the Frog Pond Skating Spectacular, and will remain closed after the show. Open New Year's Day 12:00 noon to 5:00 p.m. Ticket sales end 30 minutes before closing. The last day of the 2019 season is March 14, 2019..
For more information, call 617-635-2120. Park Street Station on the Red and Green Lines. 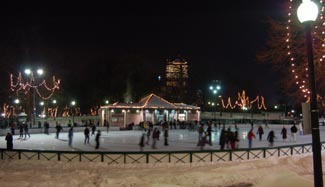 I've always enjoyed the experience of ice skating at Frog Pond in the Boston Commons. Skating outdoors in a downtown park is exhilarating! I was somewhat disappointed, though, when skating there on New Year's Day (2008) and finding the ice was severely chopped and gouged, making for a difficult hour of skating. I hope the maintenance staff can find a way to improve the ice quality and make the experience as fun as it always used to be (maybe it was just a bad day). When I took driver training in high school, the instructor quipped that a 'thickly settled district' was a place where, 'between every two houses, there's another house.' The Frog Pond is a thickly settled district. I went on a Saturday night. Surely I thought the crowds would thin once it started to get late for the youngsters, but that never happened. There seems to be a pent up demand for this sort of thing, and why not. I adore skating, and doing it outdoors on nice ice adds to the thrill. Sure, pond skating is the most romantic and idyllic, but you won't have to dodge twigs and debris on the Frog Pond, and you sure don't have to worry about falling through. Now, the ice doesn't stay nice for long with all that traffic, but for the abuse it takes, that ice surface cleans up pretty well. The crowd was well behaved, and people were just in a good mood. There's a snack bar and plenty of tables and chairs for watching it all go by. The pop music on the PA was fun to skate to and appropriate for all ages. If you're not a strong skater, avoid an obviously crowded time like a weekend evening. Unlike the people at other public rinks, Frog Pond skaters do not seem to have the inexperienced in their crosshairs, but it's still a freak-out situation if you're a beginner -- how DO that many people end up on one ice rink?